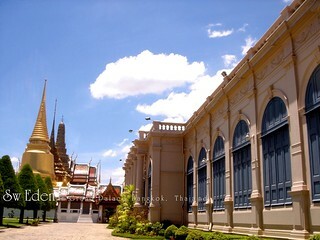 In the time of King Rama 4 -5, Thai architecture got a lot of influence from the west or European. Thai architects in that era, try to make Thailand looked modern, so the European would not use this problem, to fight to get us as their colony. Thailand is only country that has never been colony of European. I may say, just physically. In mentally or materialism, Whole world are their colony. Mostly the shot at grand palace and grand temple always have human. If not, that is when you do not include ground.